BPF - Beats Play Free: JahRucini & JahMinson "Alquimia Dub II"
JahRucini & JahMinson "Alquimia Dub II"
Regresso à mesma linha rítmica e ambiental. em ambientes electro-acústicos de JahMinson. Ritmos reggae e ambientes dub ao longo de três temas instrumentais. The element of Dub meets Jah Alchemy, for a second part. 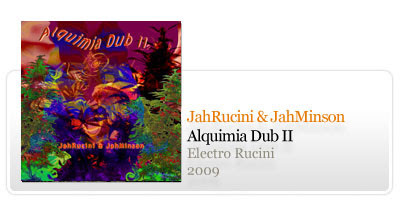 After "Alquimia Dub I" the idea of a continuum was inherent to this dub-cooperations meeting Alrucini and Minson with the Alchemy of Jah. All we need is some fresh air. To our enigmatic reggae roots. JahMinson: percussions, feedback-reverb, recordings and mixture; voice element on "Secret Number Dub"
JahXarhope: melodica sampled by JahRucini & mixed-processed by JahMinson on "Secret Number Dub".